1161 ABC Southeast, Naracoorte. New! Have been hunting this one for several years, incidentally the first proper logging on my new IC-7000! 1620 4KZ tentative, didn't wait for an ID - no other x-band stations audible. Also heard traces of 1548 Emerald and possibly 774 Wellington. Unfortunately very poor at night, only a few weak TA stations audible, none from North America. More interesting conditions in southern Norway. This evening and night was the first real test for the IC-7000. There are good points, but at least one bad point as well: The audio from the external speaker jack and headphone jack is very hissy. Seems like the hiss is in the 5-6 kHz area. It is in fact annoying. Much to my surprise though, the line-out does NOT contain hiss. I connected my ELPAF filter to the audio output and that cured the hiss problem. That done, it is evident that the receiver itself is in fact very quiet, even compared to the 746Pros. I had the pleasure of comparing audio quality of 4KZ-1620 when it was mainly at or below threshold level. 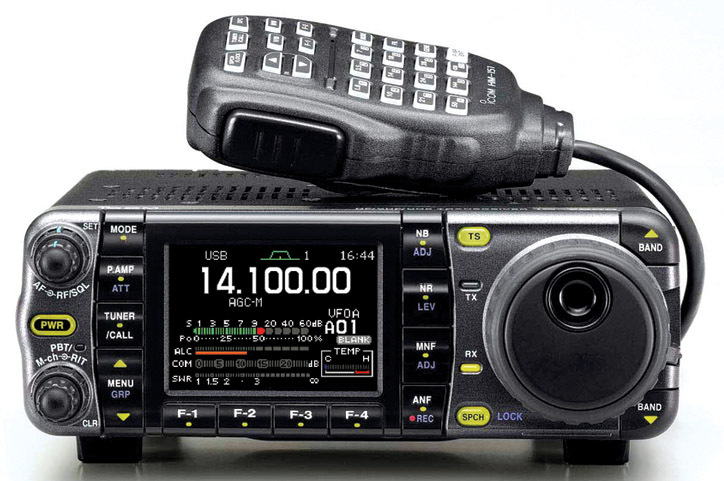 The IC-7000 matched, and partly surpassed, the IC-746Pro. I got the same impression during the night with massive interference from EU stations. Email from Cristal's engineering dept confirmed my Aug 27 reception. Very weak most of the time, but their signal improved when they were running a promotion ending with a nice ID. I've never been much of a Latin Lover, DX-wise that is, so this is my first verification from Uruguay. Finally. It has been on my wish list for the better part of a year, but I've been holding back. A new receiver (or transceiver in this case) always has its early production run flaws, and there were some issues with the IC-7000 that kept me from buying it. Last week I gave in to my basic instincts (not the Sharon Stone kind of thing) and ordered one after I got a good offer from a Norwegian retailer. I only got it today, so this is indeed "first impressions". It is very small. Well, since I already have an IC-703 I should't be surprised, but fact is: It's even smaller than the IC-703. WHD is 167x58x180mm and the weight is 2.3 kg. I am a metric man so if you want lbs and inches, you do the math. Of course, power is extra. For transmit it will need 22A at 100 watts; at receive it requires 1.6A at full volume. Specs: AM sensitivity 0.5 - 1.8 MHz is 13uV with preamp on. For the MW DX-er: Awful. But a friend of mine bought one last autumn, and his IC-7000 measured around 1uV so obviously the Icom specs were overly conservative as usual. So I took the chance and ordered one, hoping that my IC-7000 would not be much different. Excellent bandwidth options. All DSP. One can choose any set of three bandwidths for each mode from a pallette ranging up to 10 kHz for AM. A bit like the 746Pro except it had fixed AM bandwidths. So, how does it fare? The first thing I was interested in finding out was the sensitivity figures. While I set up and warmed up the signal generator I compared it with the very sensitive IC-703 and became quite optimistic. I had reason to. On the upper part of MW, sensitivity was around 0.7uV. On the middle part around 0.9, and the lower part around 1.0uV down to 1.3 on 510. LW is a joke... around 25uV on 310. I didn't go deeper. SW sensitivity was close to 0.5uV. Measured with 6 kHz bandwidth AM, 30% modulation and preamp on. These figures are in fact 3-5dB better than my friend's IC-7000. Since I was expecting no better than 1uV, I am well content. More as I start to explore its possibilities and limitations. Several Chinese stations recorded, not yet checked. Not much from the Americas unfortunately, except a couple of Venezuelans the first night and a few La Plata/Brazil stations the second night - with Radio Cristal 1470 the only one with proper levels. Three receivers are engaged at the beginning of the season; two Icom IC-746Pro and one Icom IC-703, all connected to iRiver MP3 recorders. Apart from the two beverages I also have two ALA100 loops from Wellbrook up, connected to a Dallas Lankford phaser.